Director of the Fiat engine development and - starting from 1976 - the Abarth general manager was Aurelio Lampredi, who commanded at the same time the largest Rally team of all times and was supported by the running-leader Giovanni Maruffi. His closest coworker, engineer Fernando Russo (not to confound with Rally copilot Domenico Russo), who under the direction of engineer Gianfranco Squazzini the Rally department had along-developed, prepared for 1974 no less than 28 work racers. The colour-scheme had now changed: matt-red basic colour, yellow-green flared wings and appropriate roof rings. After its release the CSA's full-led from now on a kind of game: Some ran with training, others in the Rally employment, the rest became remaining either straight repaired or by way of trial with improvements provided. The personnel expenditure was comparatively high: 34 specialized Fiat mechanics worked in four extra departments (engine, electrical connection, mechanics and body) only for the Abarth Rally. They cared also for the Group-1-sedans, which were driven in the italian national championship, where Fiat was so successful for years. 7 professional and occasionally several guest teams were engaged - all in all the fixed expenditure for the Fiat rally-department (thus still without development costs!) converted to 4 million D-Marks (2 million €) annually. 1974 came the next edition of the work CSA - with the new four-cylinder drilled out around 2 millimeters on 1839 ccm (compression 10,7:1, two valves per cylinder). In this only 900 Kilos light car it reached 170 HP, then 180 HP with 7000 rounds! 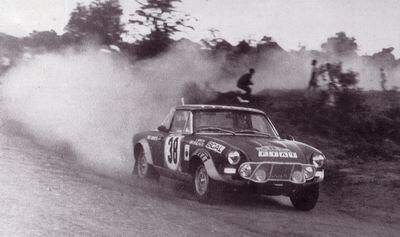 For the first time nevertheless used was the in such a way strong CSA in March 1974 with in the Rally San Remo. All work vehicles possessed before-built halogen auxiliary headlights and enormous Carello longs range headlight in the radiator grille (around it the smaller signal lights in front! ), roll-cage, plexiglass door side windows and a welded 68-Liter-Alu-racetank at the rear left. The battery moved only with the racers of the group 4 into the trunk; for series near group this was not permitted. Shock absorbers and feathers/springs were as desired changeable in the group 4 (strongly changed group-3-cars or 500 times annually finished two-seaters). Strengthened - although specially too release - brakes were permitted. And also the slight increase in output was easily comprehensible: The regulations for the car category permitted not only "eliminating the test sheet differences", but permitted besides a polishing of the in and discharge openings, doing the combustion chambers, the fine heaving over again of the crankshaft, the employment of special forging pistons as well as larger carburetor-nozzles and a high speed ignition insert. In March 1974 (the Monte and the Sweden Rally 1974 had failed because of the world-wide oil crisis) this higher performance group-4-Abarth came with the strenous TAP Rally Portugal over 2000 kilometers on the places unity to three: Pinto/Bernacchini before the team colleagues Paganelli/Russo and Alen/Kivimaeki. Running-leader Taruffi could rub the hands - the name Fiat emerged again and again in the sportsnews. "The three Fiat teams circled the Toyota pilot Ove Andersson like a ball", were it titled for example in ams, "without the Swede could really impressively resist". Accelerating with the fact it had worked surely that the 23 year old Markku Alen, one of the talented "flying Finns", changed to the Turiner giant. However the company sister Lancia had lifted her completely superior Stratos from the baptism - which led in the future to a schizophrenic double strategy. Second places became with the Rallye San Remo (Bisulli/Rosetti) and press on Regardless (POR) - correspondingly: Gas-depress without grace - in the USA (Alen/Aho) occupies. A third place jumped out with the thousand lakes Rally (Alen/Kivimaeki). Single winners with the San Martino di Castrozza became Bacchelli/Scabini. The participation Bjoern Waldegaards with a 124er Abarth was less successful with the Morocco Rally, and also the other Africa appearance did not end as desired: With three work teams the Turiner started the cars with the East African safari Rally 1974 - protected with martialischem ramming protection and powerful, then however assigned falling rocks lattices before the windshield. At the end the Kenianer Robin Ulyate straight came on the tenth place. Rally racing had the opportunity, to test the current car and was impressed: "this Fiat is not by any means a HP-Defying heap sheet metal, but like a horse, which knows the area in it's been versed!" Representatively of other newspapers the full power sheet had given up and assume its past restraint: "after one and a half season can you forget confidently the earlier achievement arrears: Fiat is on the best way to become Rally world champions of the yearl 1974. But also 1974 occupied Fiats behind Lancia (this time with the Stratos) again only the second place in the italian championship, pushed itself thereby however before Fords, Toyota and Alpine Renault. And again help the 124 Rally to the Italian meister-Titel, which the Mr. Verini and Macaluso had earned themselves. And in the lady valuation again the ladys Tominz/Mamolo was located above in the list. Still the 124er Rally, always further rigged, did its service in the hand of private drivers of far good. However they emerged end of the seventies occasionally to cheap prices in completely unexpected places as in Poland: Here once some CSA had been given as continuous loans at Polski Fiat - their ways lost themselves afterwards. Surely: The group-4 and the group-3-Homologation were long fulfilled, and other Fiat stars - everything in front the 131 Abarth - were located already in the starting holes. Dominating anyway the Lancia Stratos, that legendary running flounder, was which became several times world champion. The Italian luxury brand Lancia was come up in October 1969 in the Fiat company, and of therefore it the decision was only logical in favor of the modern vehicle. 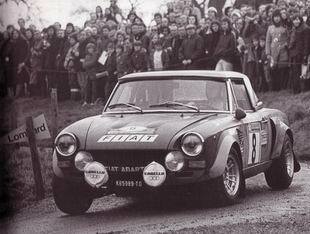 In addition the Fiat X 1/9 as Abarth 019 Prototype 2000 had been made ready, which came along with the 1839-ccm-4-valve 124 Rally of 1975, but dropped in favor of 131 Abarth. And also the Lancia A 112 Abarth turns already with the tires, even if it were finally never work-supported. Completely clearly: In addition, competition in the own house animated the business, can lead to a conclusion.